Who Guards The Most Sacred Site In Christendom? JERUSALEM — Every Christian knows the holiest places in Christendom are in Jerusalem. The holiest of all, the Church of the Holy Sepulchre, was erected in 325, over the site where it is believed Jesus was crucified, buried and rose from the dead. Yet, few know that it is a Muslim who opens and closes the only door to this holiest of Christian sites. In fact, it’s two Muslims: one man from the Joudeh family and another man from the Nuseibeh family, two Jerusalem Palestinian clans who have been the custodians of the entrance to the Holy Sepulchre since the 12th century. The Church of Holy Sepulchre during a Holy Fire ceremony in Jerusalem’s Old City. Every morning, at 4:30, Adeeb Joudeh travels from his apartment outside the walls of the Old City to bring the cast-iron key to the church, just as his father and his forebears did before him. Once there, he entrusts the key — looking like a 12-inch (30-centimeter) long iron wedge — to Wajeeh Nuseibeh, who knocks at the gate to call the priests and the pilgrims who spend the night praying inside. From inside the church, a wooden ladder is passed through a porthole to help him unlock the upper part of the enormous door. Then, he unlocks the lower one before handing the precious key back to Joudeh. The ritual is reversed every evening at 7:30, after hundreds of tourists and pilgrims have left the church. During holidays, such as Holy Week, which culminates Sunday with the Christian Easter, the elaborate opening and closing ceremonies take place several times a day. Why the elaborate ritual? As often happens in Jerusalem, a city holy to several peoples and religions, there are different versions to explain why two Muslim families hold the key to the holiest site in Christendom. “After the Muslim conquest in 637, the Caliph Omar guaranteed the Archbishop Sophronius that the Christian places of worship would be protected and so entrusted the custodianship to the Nuseibehs, a family who originated in Medina and had had relations with the Prophet Muhammad,” said Nuseibeh, a retired 63-year old electrician, while waiting in a nearby cafe to carry out his duties at the Holy Sepulchre. “It happened again in 1187, after Saladin ended the Crusader Kingdom of Jerusalem. He chose our family again to look after the peace between the different Eastern and Western Christian confessions, which were at odds over control of the Sepulchre,” he said with a gentle smile, sitting next to his son, Obadah. 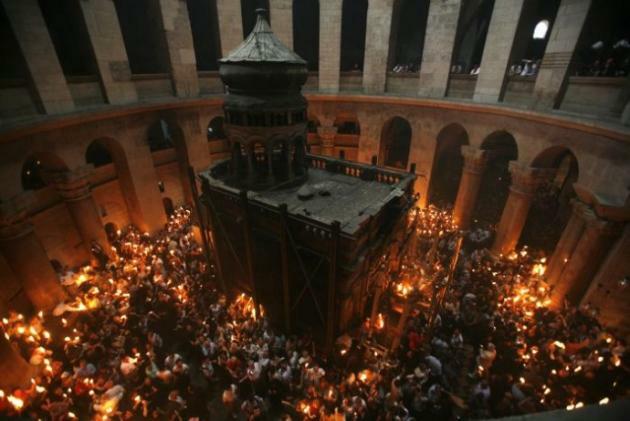 To this day, coexistence among the several Christian churches sharing the Holy Sepulchre is a delicate one. Catholic, Greek, Armenian, Coptic, Syriac, and Ethiopian Orthodox monks have resorted to fists more than once to defend their respective denomination’s rights and privileges in the church, as defined in an decree by the Ottoman Empire, known as the Status Quo of 1853. Such impious brawls between clergy proved Saladin’s prescience 1,000 years ago, when the sultan sealed the second front gate of the church and entrusted control of the remaining entrance to neutral custodians. The Nuseibehs claim that the Joudehs entered this story only in the 16th century, after the Ottoman Turks gained control of Palestine and decided to charge a second family with the responsibility of guarding the key. “Yes, we share the responsibility with the Joudehs, and sometimes we argue, as happens in a family,” Nuseibeh said. Each Maundy Thursday since the end of the 19th century, the two Muslim families give the key to the Holy Sepulchre to the local Franciscan friars, for as long as it takes to walk to the church in a procession and to open the door after the morning liturgies. When those are completed, the friars return the key to the families. This ceremony, which confirms in practice the validity of the Muslim families’ custodianship, is repeated with the Greek and Armenian communities, on Orthodox Good Friday and Holy Saturday, respectively. “Right now, I have in my hands the keys to Christendom’s heart. This is a very important moment for us,” said the Rev. Artemio Vitores, the Spanish Franciscan who is the vicar Custodian of the Holy Land, during the Maundy Thursday procession. “For centuries, Christian pilgrims were denied entry to the church, or had to pay huge sums to pray on the Sepulchre,” he said, all while holding the key. At the head of the procession, Vitores was flanked on one side by Wajeeh Nusseibeh, his son Obadah and two cousins, all of whom were equally compensated by the friars for their services with the symbolic sum of $60. On Vitores’ other side were Adeeb Joudeh, wearing an impeccable dark gray suit, and his 19-year-old son Jawad. For about 20 minutes, Joudeh ceded control of the only existing key to the Holy Sepulchre. While there is another key, it is broken and no longer used. The functioning key is normally kept in a small office attached to the church and is guarded by an employee of the Joudeh family. “This key has seen Saladin and every generation of my family since 1187. To me, it’s an honor to be in charge of the holiest of Christian places,” Joudeh said, while walking the cobblestoned alley leading to the Holy Sepulchre. He insisted on showing on his smartphone what he claimed are 165 official decrees confirming the Joudeh family’s role as custodian of the church over the centuries. At the end of the procession, the key was welcomed by cheerful pilgrims waiting in front of the church. For a few minutes, everybody stared at the solemn opening of the gate before rushing in. Moments later, Adeeb Joudeh walked home with his son, as did Wajeeh Nuseibeh. They will come back here, time and again, at the gate of the Holy Sepulchre: two Muslims, coming in peace to bear the key to the heart of Christianity. Is the Bible truly God’s Word? Has the Bible changed and altered over time? Is the Bible full of contradictions and discrepancies? Was the bible corrupted as Muslims claim? Woe to those that wrote the Bible! Use New Revised Standard Version Bible for study as it goes back to the earliest manuscripts. And use ‘The Interpreter’s One-Volume Commentary’. Dr Jerald Dirks is the guest on this episode of the deen show, Dr. Dirks is a former minister (deacon) of the United Methodist Church and revert to Islam. He holds a Master’s degree in Divinity from Harvard University and a Doctorate in Psychology from the University of Denver. Author of “The Cross and the Crescent: An Interfaith Dialogue between Christianity and Islam” (2001), and “Abraham: The Friend of God” (2002). He has published over 60 articles in the field of clinical psychology, and over 150 articles on Arabian horses. Jesus (pbuh) was sent only for the children of Israel. Jesus Christ (pbuh) was not crucified. Jesus (pbuh) was a Prophet of Allah. He wasn’t God. There were three positions in early Christians regarding divinity of Jesus (pbuh). Jesus is Man and a Prophet. Adoptionism, sometimes called dynamic monarchianism, is a minority Christian belief that believe Jesus was adopted as God’s son (Son of God) at his baptism.